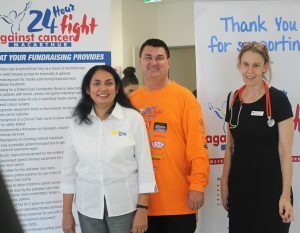 Exercise can save lives: Aruni Ratnayake, the Cancer Council’s community engagement manager in western Sydney, Warren Morrison, 24 Hour Fight Against Cancer Macarthur chairman and Dr Diana Adams, senior staff specialist medical oncology at the Macarthur Cancer Therapy Centre. Cancer patients from the Macarthur region have a new weapon in their arsenal to fight cancer – the benefits of exercise. Patients are experiencing better health and wellbeing and improving their chances of survival thanks to two exercise programs offered through the Macarthur Cancer Therapy Centre at Campbelltown Hospital. The ENRICHing Survivorship and the Active Survivor Programs support the recently launched Clinical Oncology Society of Australia (COSA) position statement on exercise in cancer care. Dr Diana Adams, the senior staff specialist of medical oncology at Macarthur Cancer Therapy Centre, said the evidence backed position statement called for exercise to be embedded as part of standard practice in cancer care and built into every treatment plan. “Exercise can reverse treatment related side effects, improve muscle mass, stamina, self esteem and quality of life, and importantly slow the disease’s progression and improve chances of survival. “I cannot say strongly enough that exercise in cancer care saves lives. Retired teacher’s aide Carolyn Fenwick, 69, of Harrington Park, is a passionate advocate for exercise in cancer care. “It’s the best thing you can do,’’ says Ms Fenwick, who was diagnosed with Non-Hodgkin Lymphoma three years ago. Exercise helped during her treatment and recovery, both physically and mentally, she said. Ms Fenwick took part in the Active Survivor Program at Macarthur Cancer Therapy Centre and now exercises regularly at Anytime Fitness. “I go the gym twice a week and walk regularly as well,’’ Ms Fenwick said. “When I exercise I feel much better and stronger. “During my treatment I had chemotherapy and 20 lots of radiation treatment and I don’t think I would have recovered as well without doing the exercise. “My message to people recovering from cancer is to exercise. Warren Morrison, chairperson of 24 Hour Fight Against Cancer Macarthur, says the local cancer charity organisation provides funds for both programs because of their proven value to patient care. “The 24 Hour Fight Against Cancer recognises the benefits of the programs and is happy to provide the funding so they can operate in our community and help our patients,’’ Cr Morrison said. The ENRICHing Survivorship Program, which is run by the Cancer Council NSW and involves eight two-hour face-to-face weekly sessions, is an exercise and nutrition program for cancer survivors. The next courses will be held on Fridays from July 13 to 21 August 21 and September 21 to November 9. Register at 1300 360 541 or email enrich@nswcc.org.au. The Active Survivor program is a targeted exercise therapy for any cancer patient at any stage of their treatment, offering supervised group exercises led by an exercise physiologist. Patients can join the program at any time. Patients can start in the Active Survivor Program by calling 4283 3522.